It is important for most people to know just how much electricity is going to cost them in France, even if it is just their holiday home and therefore rarely used. 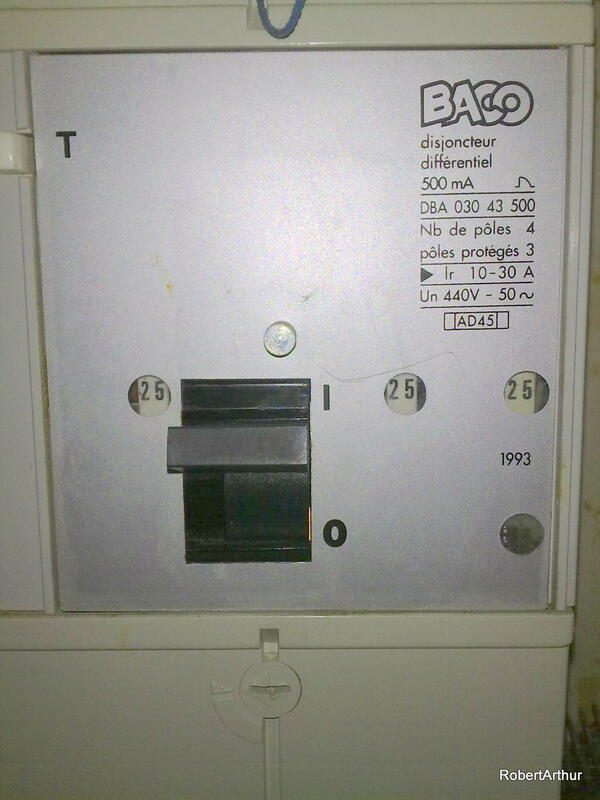 There are a number of different tariffs that you can choose for your electricity in France, where like the UK the bill is calculated by a combination of a standing charge, dependant on the supply you require (puissance souscrite) and a usage charge, based on the type of tariff that you chose (type d'abonnement) multiplied by how much you use. Bills normally arrive every two months, where the usage is estimated for two or three bills and then once the meter is read the next bill is adjusted. The actual readings appear in bold on your bill. This is the cheapest and simplest of all contract types with the cheapest standing charge and a flat rate for usage all the time throughout the day and year. It is more suitable for lower supplies, smaller homes and holiday homes with only occasional usage. This is the French equivalent to cheap rate or Economy 7 in the UK. The standing charge is slightly higher than that of Option Base, but this is offset against a lower rate for part of the day. Cheap rate runs from 10pm until 6am each night, and in some regions also at midday. This is usually used in conjunction with a switch on the hot water tank to only heat the water when a cheap rate supply is available. This option will suit the majority of houses used full time where heating is non electric. This is the by far the most complicated charging system that you can imagine for electricity, well, after seeing my tax forms maybe not. This system has six rates of electricity pricing in total. Each day of the year is colour coded, depending on the forecast of usage by EdF for that day. The tempo year starts on 1st September. The tempo day starts at 6am. There are 300 blue days, 43 white days and 22 red days per tempo year. Sunday is always a blue day. Red days can not fall on a holiday, weekend or more than 5 weekdays in a row. They only occur from the start of November to the end of March. The good news is that this means, despite the increased standing charge, electricity on blue days is by far the cheapest that you can get it, and during the cheap rate on a blue day the rate is extremely low. On white days the rate is higher than either option HC or Base, but not by much. The bad news is that on red days the cost is a little over seven times that of cheap rate blue, i.e. it is prohibitively expensive to encourage lower usage. Of course these days are usually the coldest of the winter. The main draw back is that you don't know what colour the next day is until 8pm the night before. You have a display unit that plugs into any socket in your home that picks up a signal from the supply and so the unit displays the colour with a light, both for today and the next (from 8pm). Alternatively you can look at the EdF website (in French): EDF Tempo Colours or check your meter. This option is for high use households, such as very large houses, gîte complexes and those with electric heating and full time occupation. Tri-phase is found in many older properties, especially farms and buildings in rural areas. It is not recommended for domestic usage and if you are unlucky enough to inherit a tri-phase supply (it will be marked on your meter) then ask EDF to exchange it for mono-phase as this will greatly simplify any new wiring and reduce the chance of 440 volts going into your 240 volt equipment from the UK. There are nine main domestic power supplies ranging from a paltry 3kW to a massive 36kW. To calculate the level that you need just add up all the items on the list that you would wish to use at the same time, then select the next supply above this amount. So, for example, if your list adds up to 7800W (7.8kW) then choose a 9kW supply. If you have something that is not listed then it usually has the power consumption written on it somewhere. Look for a label that says Consumption or Power In and look for a figure in watts(W). Your bill will show your usage in kWh. 1 kWh is calculated as using 1 kW for 1 hour. Thus if you run a 100w light bulb for 10 hours the usage will be 1 kWh (0.1 kW times 10 hours). 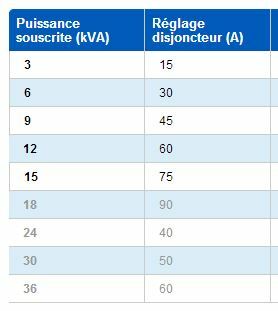 The two prices to know in order to calculate your bill are the standing charge (l'abonnement) and the price per kWh (Le prix du kWh) for each rate that you have. To get some idea of what you will pay look at the table below, which is the current pricing for the option Heures Creuses (correct January 2016, prices in € including tax). Thanks Dave, that is very useful information and clearly explained - even I can understand it! Does anyone know what the standing charges are now for Edf? A quick reference table, how much power (puissance souscrite) do you get, and how many amps. The EDF used to provide up to 18 kVA in single-phase, but for new builds and renovations this is something of the past. The maximum you can get these days in monophasé is 12 kVA (60 amps). More power? Switch to three-phase (triphasé) and read the EDF table as follows. The 15 kVA (75 A) abonnement will give you 25 amps per phase, the 18 kVA (90 A) abonnement 30 amps per phase (réglage disjoncteur). Reviewed and updated pricing and links.